The Little Whisk & Co: Al Fresco Entertaining. 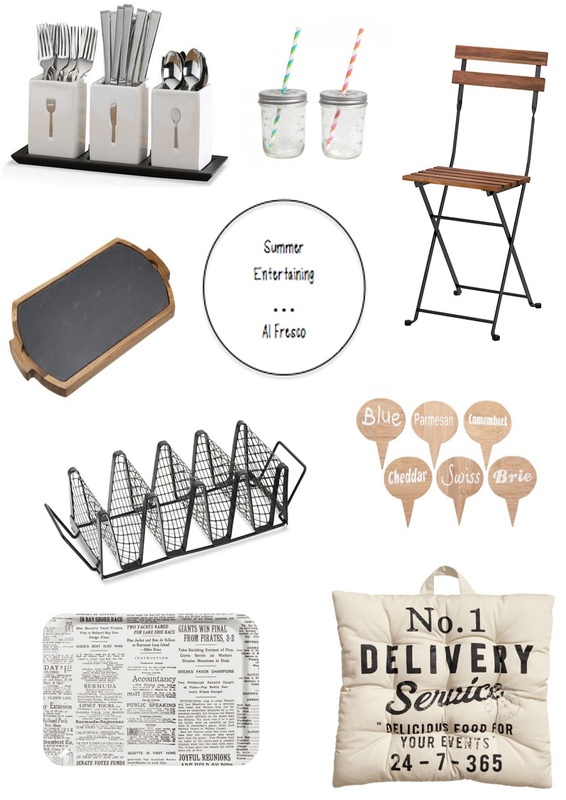 Seeing as it is springtime in a lot of places around the world and will shortly be summer, I thought it would be a nice idea to show you some home wares that you can put in your outdoor entertaining area in the warmer months. In Australia our summer usually last the same length as other countries winter, which if you think about it is a super long time with the amount of snow days there are. So as we can still occasionally convene outside and admire the country, I thought it would be suitable to show you some possible ideas for your own homes. Anyway, all of these products follow a similar colour tone of neutral, natural and organic, which does not over power your dining areas and easily allows you to add in a pop colour for whatever suits your taste and with the colour that is currently on trend. I am slightly obsessed with all of the items and cannot wait for the day when I purchase my own home and can most definitely use a taco stand for all of my crazy Mexican evenings. Is anyone else a lover of the Mexican cuisine like me? I thought this was an incredible design and am actually considering purchasing one now! A lot of items now a days you can recreate yourself, which is amazing because you save money and personalise it to your own style. Anything that is "DIY" is a nice addition to your home, because it sends an 'at home' and 'creativity' vibe. It is also nice to just add little trinkets, trays, pots and glasses outside to fill with nibbles, decorations or to simply have as a decorative piece. So I hope you have enjoyed this style of post and I have planned some additional lifestyle themed posts for the future that are going to give you an insight into a number of different rooms and possible ways to decorate them. Let me tell you now, I am quite excited for this one because I just love decorating, experimenting with shades and finding new home stores (This will also be another post). My favourite cooking Instagram accounts. Sticky Toffee & Walnut Cupcake. Styling a Black Pinafore Playsuit.